Now the use of PDF file has become important part of our work. PDF is the form of file through which we can share our important documents from one place to others in couple of minutes. 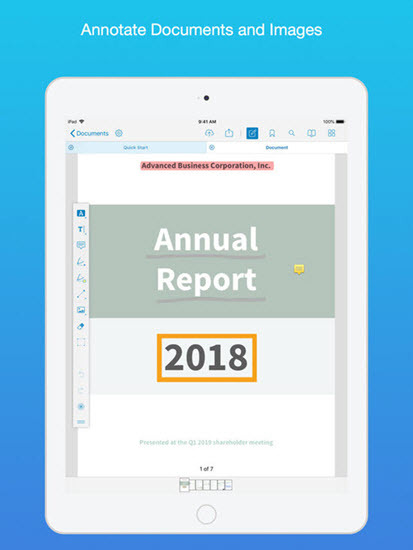 For iOS devices editing PDF is bit difficult and complex, since you need to find a good PDF editor.You can find many applications on Internet for editing your PDF, but which app is the best? How to know if the application gives you features according to your need? 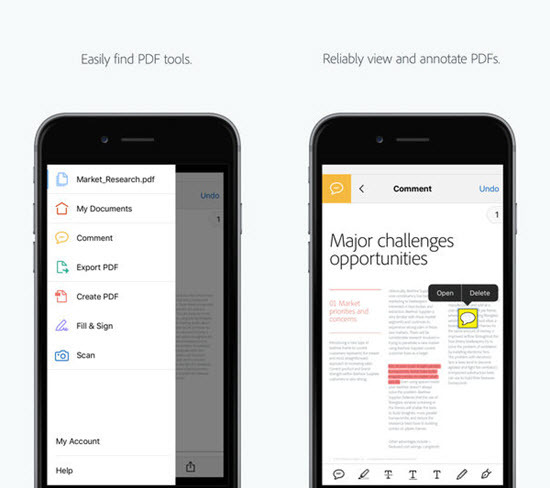 Here we have picked up the top 8 best PDF editing applications for your iPhone and iPad, with which you can easily edit your PDF files with other great features. Tips: If you lost any precious data from iOS device, like message or contact, Gihosoft iPhone Data Recovery will always help you recover lost or deleted data easily and quickly from iPhone or iPad, even if you don’t have backup. With the new update of this application you get high- speed file sharing and great data protection. Here you get all new SMB v2 support. 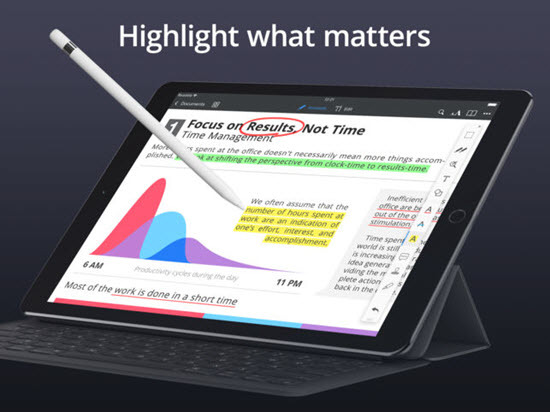 If you are searching for the best application to read, highlight and edit PDFs with great features on your iPad and iPhone, this is the application you can go with. And if you go with the full paid version of the same app, you will get served with unique features like replacing pictures and hiding sensitive details easily. Here you also get super PDF editing features with this PDF expert. The App has clean interface so that its users can work freely without any disturbance. 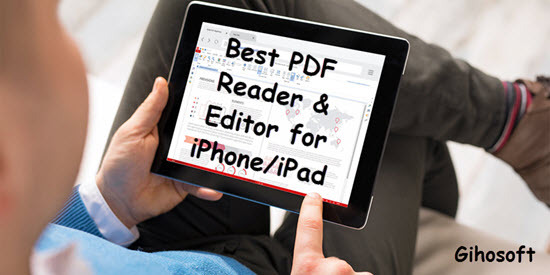 No doubt this is the best application for PDF editing on iPad or iPhone, ranking at number 4 in the business category. The application gives you clean and clear interface for fast and smooth work. You can add comments on your PDF files by using sticky notes and drawing tools. The application provides you new additional features to highlight the text. The application also gives you permission to record, rotate and delete unwanted words. This is a great application more than a PDF editor for iOS devices. You can edit your PDF as well as manage your other files. This App is very simple and gives clean and smooth interface to its users, so the user can work without any disturbance. The App permits you to work on multiple formats like MS Office, TXT, HTML,etc. Here you also get different options like, rename files, zip/unzip files, unRAR files and folder. You can connect cloud services like Dropbox, OneDrive, Google Drive, Box.com, etc. to store your application data. This App allows text-to-speech features to read your PDF and TXT files for fast work as well. This is a user-friendly application with smooth work and high responsive rate for PDF reading and editing on iPad or iPhone. You can enjoy your work with interesting features like, adding images or drawing different shapes very easily. 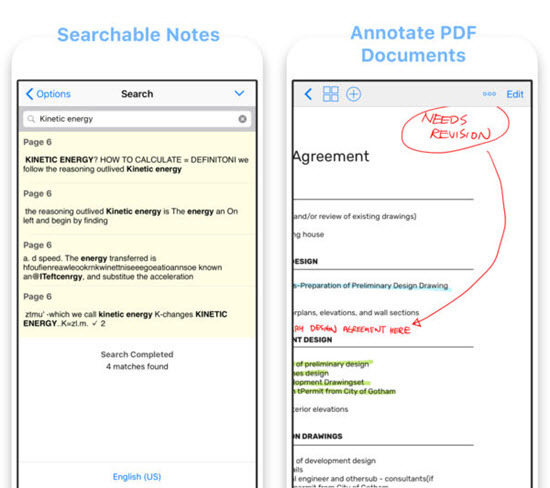 You can also mix any type of paper and be able to add PDF docs under a notebook as well. Here you get numbers of notebook cover and templates as you like. You can insert different images using templates or PDF file. Through its advanced OCR technology you can search your handwritten notes. This PDF reader app only supports iOS devices like iPhone and iPad. This Application works very fast and smooth, also allows user to view, read, search and edit PDF files very easily. You can also access your files via iCloud, Google Drive or any other cloud service supported by this app. Recently it has updated and now is compatible with the latest iOS versions, along with its fast-page changing improvements. You can also get additional features like, adding comments, photographs and even audios to your files. It gives users a clear and clean interface with unique night mode for reading in dark light. 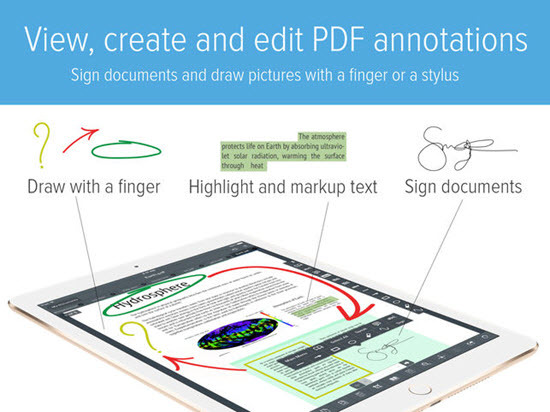 This is a great application for sharing, reading and editing the PDF files on iPad or iPhone. 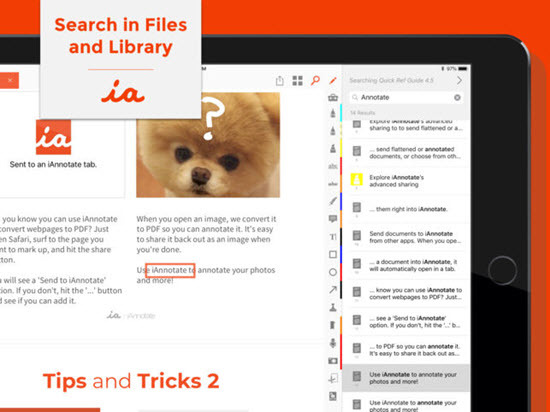 You can also edit the Microsoft Office files, add images and web pages in this app. There are around 1 million users of iAnnotate who use it to sign agreements, add stamps, take notes, highlight document and much more. Recently the application got update and added new features like multitasking support, automatic Apple Pencil detection, improved web markup and so on. Here you also gets support for OneDrive and OneDrive business, iCloud Drive and backup function. This is a great application in which you can read, edit and even convert your PDF files on iPad and iPhone. This Application is simple and easy to understand. It allows users to view, read , edit and protect files on iOS devices. It supports 12 different languages, including English, Dutch, French, German, Italian, Japanese, Korean, Portuguese, Russian, Simplified Chinese, Spanish and Traditional Chinese. It supports different file formats as well, such as MS Word, Excel, PowerPoint, TXT and image files. You can copy, rename, move, delete, zip and unzip files inside this app. 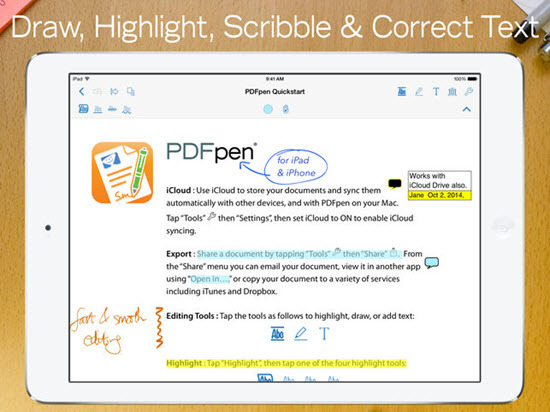 PDFpen 3 is a useful application for iPhone and iPad users to read and edit PDF files. With it you can draw freehand and highlight lines, fill an application form, and even highlight comments on presentation. You can get different features in this app like, underlining important text, editing page content, correcting and adding text, and you can also add, move, resize and also delete pictures. You can get special feature like adding signature and after editing your PDF you can also email directly. This is a user-friendly application so that you can work without disturbance. These are all the 8 top best selected PDF editing applications for your iPhone and iPad. All application listed above provide its user clean and very attractive interface.You can choose the best application according to your need to read and edit your PDF files. 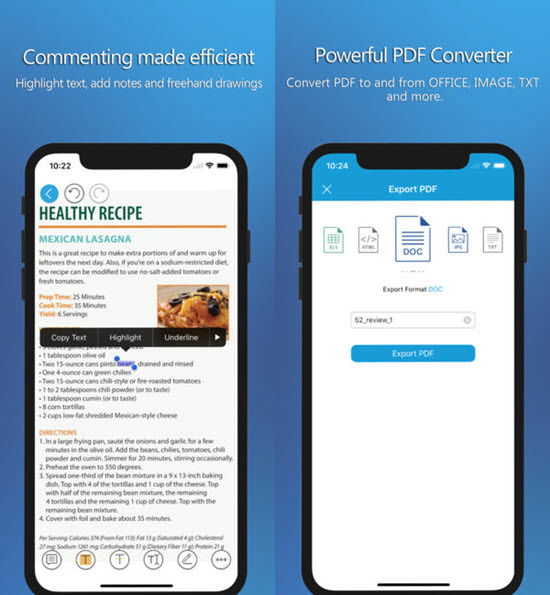 What do you think about these apps as PDF reader? If you have any suggestion or question, welcome to share with us by commenting below.